It is hard not to be seduced by the 36 enigmatic photographs that make up John Divola’s Artificial Nature, currently on view as part of the exhibition John Divola: As Far as I Could Get, which closes this Sunday. 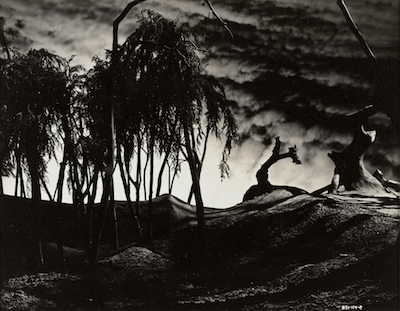 Made by anonymous photographers working on the sets of films produced during the classical era of Hollywood movie making (roughly 1930–60), the photographs were generated by the millions—yet another industrial element of the so-called dream factory. 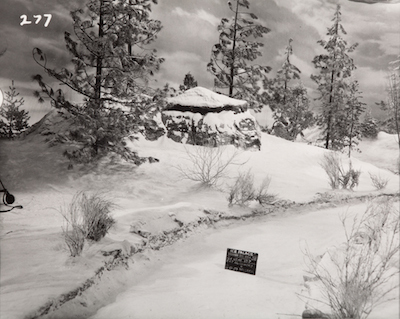 Produced from 8 x 10 glass negatives, the direct contact prints feature a remarkable amount of detail and image clarity. Eerie and lifeless and packed with incidental information, they are arresting objects in their own right, worthy of close scrutiny. Artificial Nature, first exhibited in 2002, is the most recent addition to Divola’s Continuity series, in which he appropriated set stills to create his own conceptual artworks. Beginning in the 1990s, he began to exhibit these production photographs mined from the vaults of the major Hollywood film studios. 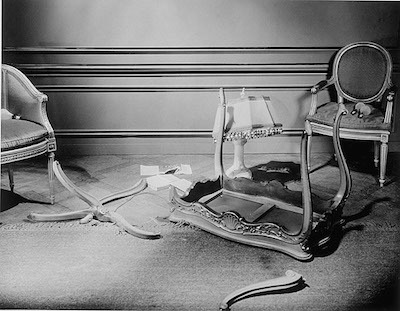 In a series of displays, he grouped them by theme, or genre type: hallways, stairs, mirrors, and “evidence of aggression”—the latter of which recorded the traces of violent activity in domestic settings, much like his own well-known photographs of vandalized abandoned homes. The original purpose of the set still was simple and utilitarian: to aid in the construction of seamless cinematic narratives, ensuring that the sets remained constant from take to take. A genre built around the static image—the very name connotes stillness—the set still seems to betray the logic of cinema. Such frozen images are anathema to the visual effect of “motion pictures.” It is this paradox, among others, that Divola interrogates in his Continuity works. 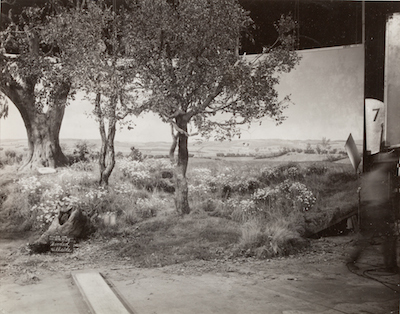 Artificial Nature is a collection of images documenting the fabricated landscapes contained within the artificial space of the film studio. Representing diverse natural topographies and weather patterns, many of the images also include a small clapperboard with the title of the film or the name of the scene scrawled on it. If the viewer is seduced by the illusion of the cinematic vista, this small detail, interjected into an otherwise convincing representation, insists on the artificiality of the scene. 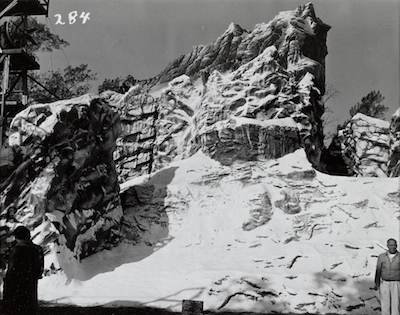 Of the three films identified in the images—As the Earth Turns (1934), Ice Palace (1960), and The Mudlark (1950)—Ice Palace is the only one appearing multiple times. So, with that numerical advantage noted, I managed to find a VHS version of the film (no small feat) and gave myself the assignment of watching it in order to identify some of the sets that feature in the continuity images selected by Divola. The film is a schlocky melodrama with Richard Burton and Robert Ryan about romance and valor in Alaska in the years before its statehood. 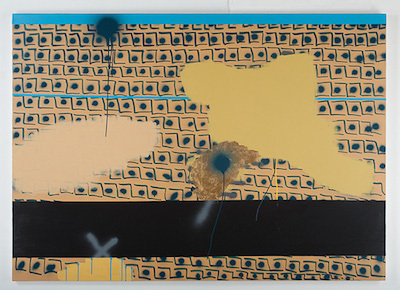 The plot is irrelevant here, beyond the fact that it explicitly engages with ideas about the conflict between nature and civilization, which are at the core of Divola’s reappropriation of the set stills. I watched the film closely and endured what I could of the narrative in my attempt to find the sets that appear in the set stills. This was much harder that one might think; I might even be forced to admit failure. At times, I wondered if I was even watching the correct film. Divola might agree with that review. At its core, Artificial Nature questions the way that the physical world is increasingly experienced as a representation—something that we understand through layers of mediation. In selecting these objects for display, he highlights how we have inserted a deliberate distance between ourselves and the natural world, a distance that is only accentuated by cinematic representation. In this work, as in so many others by the artist, we are brought back to the status of the photographic image as both truth teller and talisman—simultaneously a document and a cipher. My flaccid attempt at deciphering the continuity stills served only to remind me of their opacity and unreliability as referents to actual things in the world. Divola, I’m certain, would have it no other way. On the last weekend of the month, visit LACMA for all new art, music, and film. 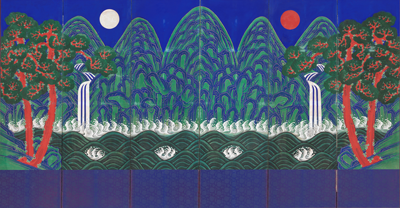 Opening on Sunday to the general public, Treasures from Korea: Arts and Culture of the Joseon Dynasty, 1392–1910 presents over 150 works from Korea’s final and longest-ruling Confucian dynasty. Check out Korean national treasures never before seen in the U.S. and learn about how this 500 yearlong reign influenced modern Korean culture. Treasures from Korea is open to members first during Member Previews on Friday and Saturday. Friday, Jazz at LACMA presents the pitch-perfect sounds of Sara Gazarek at 6 pm in front of Urban Light. In the Bing Theater, Spike Lee’s acclaimed 1989 comedy-drama Do the Right Thing screens at 8:30 pm with the director and crew in conversation. Tickets for this event are standby only. Earlier in the evening at 6 pm, the Inglewood Art+Film Lab opens its doors to the community with live music from the polyrhythmic Norwalk-based band Buyepongo and an outdoor film screening at 8:30 pm. Visit the Lab at the Inglewood Public Library through July 26. Saturday, Jose Rizo’s Mongorama nine-piece Latin-jazz ensemble preserves old-school tunes with a fresh, modern take at Latin Sounds at 5 pm. Join free, docent-led tours throughout the day including a 20-minute look at the glowing sculpture of Helen Pashgian: Light Invisible (closing after Sunday) at 1 pm and and a full-length tour of European art at 3 pm. Sunday, Andell Family Sundays explores LACMA’s collection of Egyptian art at 12:30 pm and later in the evening at 6 pm Sundays Live presents violinist Phillip Levy, violist Andrew Duckles, and cellist Jason Duckles in the Bing Theater. On its final day of display, Four Abstract Classicists features the pure abstractions of four Southern California painters, and in its final week Chinese Paintings from Japanese Collections shows some of the most precious paintings by Chinese artists held in Japanese collections; the exhibition features some works never before seen outside Japan. Finally, John Divola: As Far As I Could Get presents the work of the contemporary artist that merges photography, paintings, and conceptual art. How is sound related to vision? Last month, LACMA premiered a new workshop at the roaming Art+Film Lab that asked participants to do something radical. Montebello residents spent time looking and listening to a two-dimensional work of art from LACMA’s collection, making sense of the painting not just through sight, but using their ears as well. In just 45 short minutes, groups worked together to create spontaneous soundscapes that activated the paintings in new and extraordinary ways. We transformed into sound designers for the class. To warm up, we looked at Laura’s Owen’s Untitled from 1998. The painting features a large, jewel-toned beehive swarming with insects at work. Participants were asked to pretend to step into the painting to take a look around them. Their imaginations ignited. We asked them to think about a few questions. What kinds of sounds do you hear? What is around you that you can’t see in the painting? Is it also making a noise? How far away is the noise from you? Immediate reactions were sweet. The younger ones used their teeth to create soft buzzing noises and pom-poms to mimic the sound of the grass swaying in the wind. Seconds later, screams rang out as some realized they were not wearing a protective bee suit, while others remained calm and flicked the table with their fingers to create the sound of the bees running into the hive, missing the entrance altogether. Each group was asked to choose an artwork from LACMA’s collection for their soundscape. Some spent their time looking closely, examining every part of the artwork and scheming interesting narratives, while others huddled around the table covered with instruments and sound objects (rope, beads, empty boxes, pom poms, etc.) brainstorming sounds and how to best recreate them. 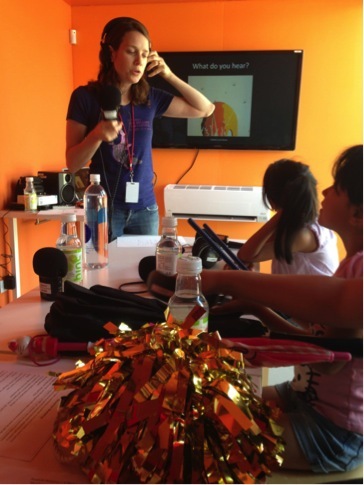 Groups reconvened in the lab and presented their soundscapes with explanations about the setting and the objects used to make the sounds. 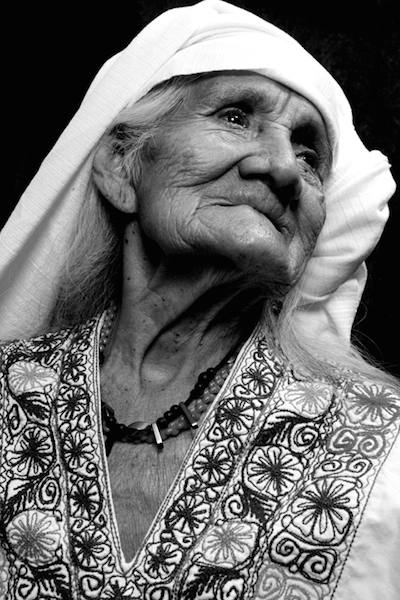 During one performance, a grandmother instructed her grandchildren to close their eyes and take in the sounds they developed together. “Does the painting move in your head now?” she asked. They nodded their heads. When designing this workshop for LACMA9, we wanted to explore a kind of conceptual resonance between image and sound, to echo the work pioneered by audio collectors and designers like Michel Chion, and to try to put ourselves in the shoes of artists like Wassily Kandinsky who lived and painted with synesthesia, the neurological phenomenon that confuses and intertwines the body’s core senses. During the Sound Art workshop, we experiment with play while experiencing the artworks we feel connected to in a way that celebrates our imaginations and ability to work as a team. Have you ever imagined what a painting might sound like? Give it try here. If you were inside of the photograph above, what would you hear? What kinds of noises and sounds would you include in a soundscape for this image? What about the image inspires sound? Submit your responses in the comments! Sound Art may be coming to your town. Check the links below for dates in Inglewood and Torrance. 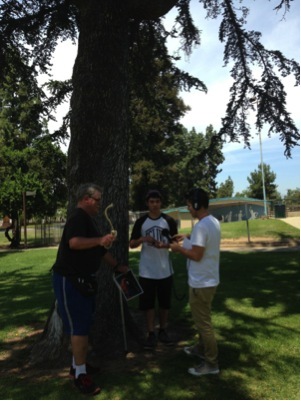 Listen to the soundscape this group created for Jeff Barmby’s Vallejo. Inglewood has a rich history of art. 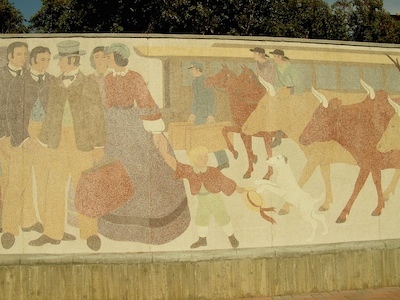 It boasts many public artworks, such as Helen Lundeberg’s WPA History of Transportation mural, made in 1940, and Richard Wyatt’s 1987 Inglewood Project. It’s also home to the annual Open Studios, an event that showcases the work of local contemporary artists. In an effort to honor Inglewood’s creativity, we organized an open call to artists who reside in and around the area, as part of the Inglewood Art+Film Lab, which begins its five-week residency this Friday. Our pop-up lab, which is organized by LACMA and which will take place in and around the Inglewood Public Library as well as the Beacon Arts Building, is host to a variety of programs, including free film screenings, film and video-making workshops, and the gathering of oral histories from community residents. Inglewood is the eighth of nine stops around Los Angeles for the Art + Film Lab, but this was the first time we put out a special call to artists. We wanted to collect digital images of visual art to be projected prior to the free public film screenings happening each weekend for the next five weeks. We were thrilled to see the extraordinary amount and quality of work that artists submitted, ranging from paintings and photographs to new media installations and fine decorative crafts. Of course this is no surprise, given the artistic renaissance Inglewood has seen over the past several years. Whether it’s the growth of the Beacon Arts Building (an adapted former Bekins storage facility), or the many murals and projects created as part of Inglewood Cultural Arts (ICA), the city has had a dramatic rise in art innovation. ICA’s annual Open Studios draws hundreds of visitors to see the artists at work, some of whom are natives and some who are transplants from different parts of the country. One such artist is Holly Tempo, whose work explores the cultural history and psychology of urban environments and blends traditional elements of painting with elements of street art. An active resident of the city, Tempo helps organize the annual Open Studios and teaches in neighboring Otis College of Art and Design. 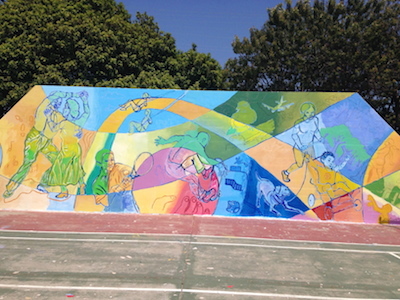 Artist John Ildefonso, who is also participating in the project, uses his work to explore his culture and identity as a first generation Mexican-American. Other participating artists are Virginia Broersma, Deborah Lambert, Lee Clarke, and Feliz McInnis, among others, all of whom have different means and intentions of expression. The spirit and love of art that exudes from these groups and individuals are what the call to artists project is meant to share. To see these works and others, join us this Friday on the lawn of Inglewood City Hall for the opening night of the Inglewood Art+Film Lab, which will feature a live performance by Buyepongo, a screening of animated shorts by emerging filmmakers, and the celebration of the creative culture of Inglewood. We in the Boone, or “Boonies” as we are oft referred to, are officially called “Gallery Facilitators.” This title is particularly fitting for the work we have been doing with the new bojagi project in the Boone Children’s Gallery. Not only do we facilitate art making, but also conversations about art and art making, and the development of new skills and techniques. Three outcomes of the project have particularly stood out: the level of excitement and enthusiasm, the awe-inspiring creativity of our visitors, and the ways in which people interact with each other and the project itself. When this project was first proposed, I worried that not enough visitors would be interested in sewing. I could not have been more wrong. We have excitedly witnessed everyone from three-year-old twins to teenage groups of friends and grandfathers actively participate. In fact, the bojagi has allowed those who would not usually participate in the gallery to create something. With the bojagi, there is something for everyone to do in the Boone. In addition to the multitudes of folks coming into the Boone specifically for the bojagi, scores more, who initially come to paint, become interested after seeing the curiously large patchwork textile. After filling them in on the project and explaining what a bojagi is, nearly all visitors become eager to add their piece to what we hope will be the world’s largest recorded bojagi. Seeing parents, grandparents, friends, and siblings learning to sew together has been very rewarding. More and more have we seen whole-family interaction. Families speak about the project and to one another in very positive ways and leave feeling proud and excited about having contributed to a large community-driven activity and the new skills they have learned. We have also noticed families staying much longer in the Boone and being more actively engaged; some visitors will sit down and sew for two hours, producing a sizable piece to add on to the bojagi, and others will vacillate back and forth between painting and sewing, sometimes even combining the two. Whereas painting can be a very singular or intuitive process, those who chose to sew are very open to suggestions and learning new techniques from staff and from other visitors. Just as the bojagi is a community project, a community has been growing around it, including complete strangers, who just happen to be sewing at the same time, striking up conversation and building relationships; a frequent occurrence. Although they are unable to take home what they have created, our visitors rarely take issue with having to leave their work behind, as they know they are contributing to a larger project and are excited about it. There are even many instances in which children want to continue sewing or request to sew at home, to which parents have been receptive and encouraging. In this way, both kids and adults can continue practicing their new found skill and hopefully bond over a shared and continued experience. This new project has brought us closer with the public and also with each other. We hope to keep building these experiences with you for the duration of the bojagi project and beyond! The last day to contribute to the community bojagi is Monday, June 30, so don’t miss your chance to add this to monumental project! This Weekend at LACMA: Two Nights of Film, The Story of Venice, Free Nightly Concerts, and More! 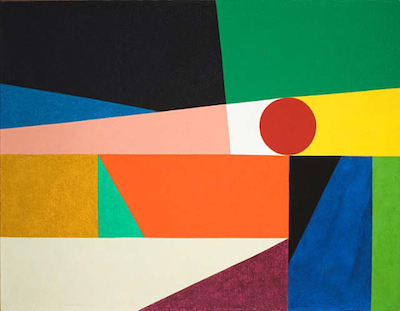 Bask in the sun of a new summer this weekend at LACMA. Friday evening the talented Korean director Bong Joon-ho (The Host, Mother) presents in person his debut English-language film Snowpiercer, a darkly lavish science-fiction thriller that boasts an esteemed international cast led by Tilda Swinton and Chris Evans, at 7:30 pm. The Nick Mancini Collective performs at Jazz at LACMA at 6 pm featuring the vibraphonist and bandleader Mancini. Jazz at LACMA is free and open to the public. On Saturday join the 20-minute tour of Helen Pashgian: Light Invisible at 1 pm or a quick survey of 17th–century Dutch portraits, including Rembrandt and Hals at 2:30 pm. At 2 pm in the Brown Auditorium Bill Mohr and George Drury Smith look back at the literary heritage of Venice, California and read poems in the exhibition Edward Biberman, Abbot Kinney and the Story of Venice. This event is free and open to the public. In the early evening at 5 pm, Latin Sounds presents Argentinian-born vocalist Esther Segovia “La Gotan” in a free concert in Hancock Park. Finally, as part of the Arab Cinema Classics film series, see West Beirut and the story of the tumultuous spring of 1975 and the unfolding of the Lebanese Civil War. Take it easy on Sunday with Andell Family Sundays at 12:30 pm, making your own Egypt-inspired art and exploring the collection of Egyptian art. In the galleries a few exhibitions reach their conclusion, including Agnès Varda in Californialand, Modern Japanese Prints: The Juda Family Legacy, Pavilion for Japanese Art: Paintings in Celebration of Twenty-Five Years, and Murmurs: Recent Contemporary Acquisitions. Dive deeper into the collection with the 1 pm docent-led tour “Medieval Stories in Stone” or a full walkthrough of the exhibition Chinese Paintings from Japanese Collections at 2:30 pm. Then at Sundays Live pianist Daniel Schlosberg performs Johann Sebastian Bach at 6 pm. Summer’s here! LACMA recently invited the award winning-documentary filmmaker Lucy Walker to direct several films for the museum. The short film she made for LACMA about artist David Hockney was recently nominated for best short documentary at this year’s South by Southwest festival, was shown at the prestigious Sheffield Doc/Fest in England (which takes place near Bradford, Hockney’s birthplace), and has just been featured in the Los Angeles Film Festival. Lucy spoke with Erin Wright, LACMA’s Director of Artist Initiatives, to talk about her work with the museum. Erin Wright: I wanted to start by asking you about our first collaboration, The Museum, Reimagined. Can you briefly say what the film is about and what inspired the look and feel of this work? Lucy Walker: The film is a conversation between architect Peter Zumthor and Michael Govan, LACMA’s CEO and Wallis Annenberg Director about the new building for LACMA that they have dreamed up. I wanted the conversation and the ideas to be the heart of the piece, and the simple black-box background was inspired by the viewing room that Zumthor had designed for the exhibition about the building at LACMA. I wanted it to feel as if Michael and Peter were sitting in the black box with you, and the viewer was an intimate part of the conversation. EW: Did that film change your thinking about LACMA and the plan for our campus proposed by Peter Zumthor? LW: I fell deeply and completely in love with the proposed building, and I would pay for it myself if I could! I couldn’t be a bigger fan of the project and am desperately hoping it will come to pass. To get to know the building is to fall in love with it. It would truly be a new kind of museum for our new century and could be the new heart of Los Angeles. EW: Had you ever worked with a museum before on a film project? LW: I’ve never before worked with a museum aside from filming inside museums for my film about Vik Muniz, Waste Land. I was a little intimidated at first, but I must say I could get used to the fabulous reverence with which artists are treated, I think filmmakers are generally used to being abused! EW: You are well known for your feature-length documentary films, but a few years ago you received and Academy Award® nomination for the short The Tsunami and the Cherry Blossom. What’s compelling for you about the short-form documentary? LW: I love making short work because it allows you to tell stories in different ways. The perfect length for a movie, I like to say, is 15 seconds short of boring. And what’s fantastic about short films today is that there is such an opportunity for them to be seen at fantastic events (such as the Art+Film Gala), at film festivals, and especially online. EW: Making the film David Hockney IN THE NOW (in six minutes) for LACMA’s Art+Film Gala to honor Hockney was a wonderful opportunity for us to continue working together. Can you say a little about why you were interested in Hockney as a subject? LW: I grew up in London and have always loved David Hockney’s work—my father was a fan and took me to see his paintings when I was a child, and it made a huge impression on me. Later as a keen high-school art student I became fascinated with his work and treasured his books and shows. And of course as a Brit living in L.A. he is now even dearer to my heart than ever, as I feel I am treading in his footsteps and I really relate to his appreciation for this city. Click through this still from David Hockney IN THE NOW (in six minutes) to watch the complete film by Lucy Walker on artist David Hockney. EW: Honoring David Hockney and Martin Scorsese last year was part of a larger Art+Film initiative at LACMA. Have any of our recent film related exhibitions (like Stanley Kubrick or Gabriel Figueroa) had a particular resonance for you? LW: I confess I am a huge LACMA fan, and a great appreciator of so many exhibitions. If you force me to pick just one, the Kubrick show had a particular hold over me because Kubrick might be my favorite director of all, and his process is so particularly meticulous and fascinating and rich, and the exhibition was so fascinating, I kept going back for more and more and more. The James Turrellshow was also a recent highlight, I admit that I am such a Turrell nut that I once drove to Roden Crater and camped nearby, just to get a glimpse. It sounds too obvious to even state, but for me it a powerful truth, that looking at art inspires and informs my film work, my whole life. 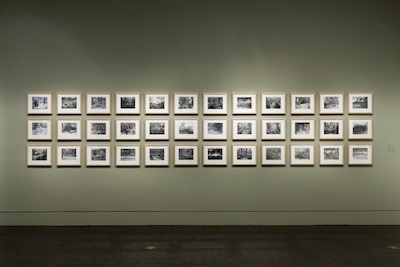 You are currently browsing the Unframed The LACMA Blog blog archives for June, 2014.